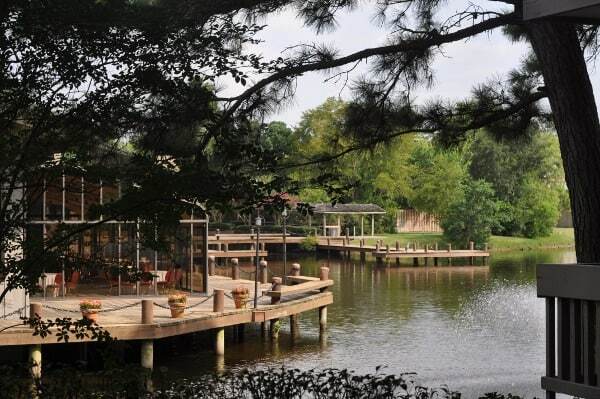 Home»All»An Amazing Family Vacation… Just 30 Minutes Away. 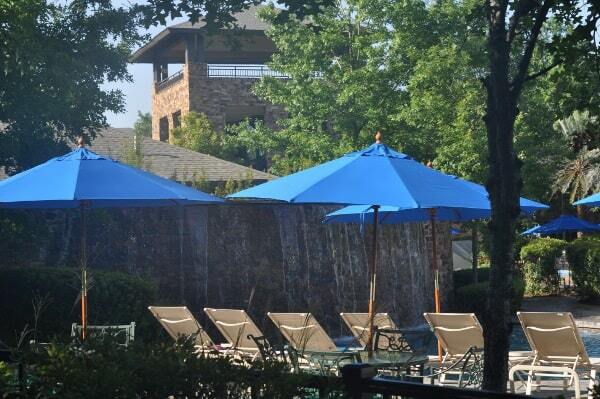 Tips for Visiting The Woodlands Resort! 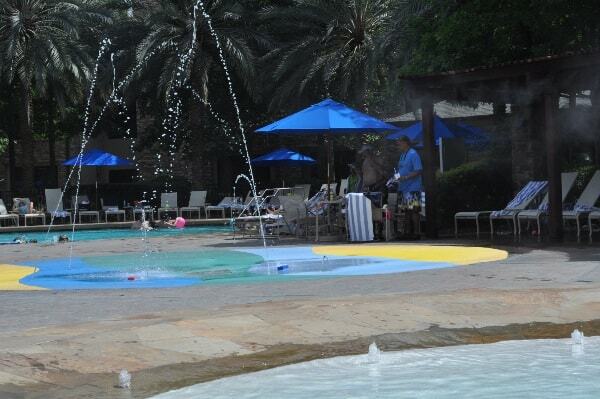 An Amazing Family Vacation… Just 30 Minutes Away. 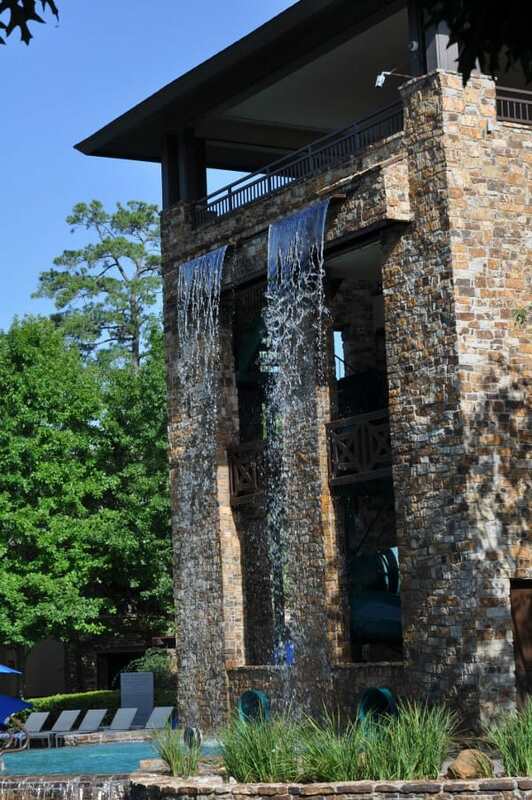 Tips for Visiting The Woodlands Resort! I think family vacations are hard… coordinating schedules, buying tickets, booking hotels, planning out itineraries and packing every kid thing we might need is overwhelming and probably why we rarely take big family vacations. Besides visiting grandparents, we generally stick to day trips. The trick with this is, we never really take a break from our daily routine and rarely just enjoy free time as a family. 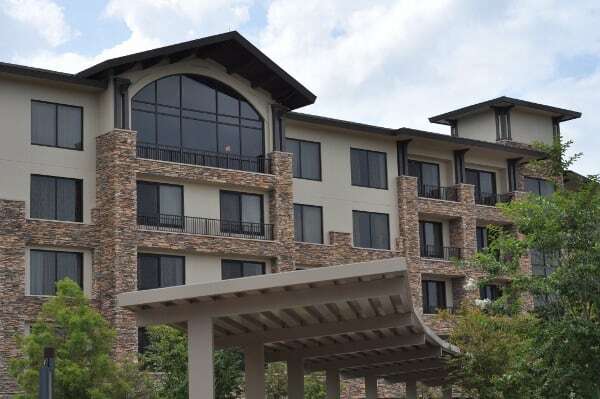 I thought it had to be hard work and a big trip to enjoy a summer vacation, but I just returned from a weekend at The Woodlands Resort and had my mind changed. 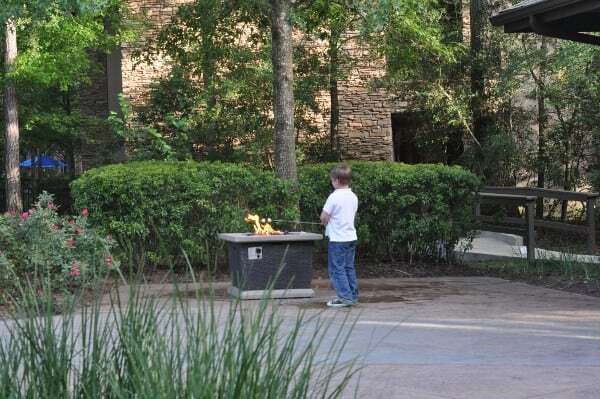 The Woodlands Resort invited me out for a week and completely changed my attitude towards family vacations. We had 3 days and 2 nights at the pools, bike trails, spa and restaurants… and felt like we had real deal, hard-to-plan vacation… but all we did was book a room, drive 30 minutes and enjoy. I had been to this resort for business conferences, but never for a vacation. I have to say that rooms are nice, the pools are great and the customer service was amazing. From letting us check in early (as soon as our room was available), to taking in our bags, to finding us bikes to borrow, to carting us around on golf carts to unlocking our room safe when a certain blanket was mysteriously trapped inside to making crafts by the pool, the staff insisted on helping. The staff did a good job making sure we could just focus on enjoying the resort. And this is what we did! 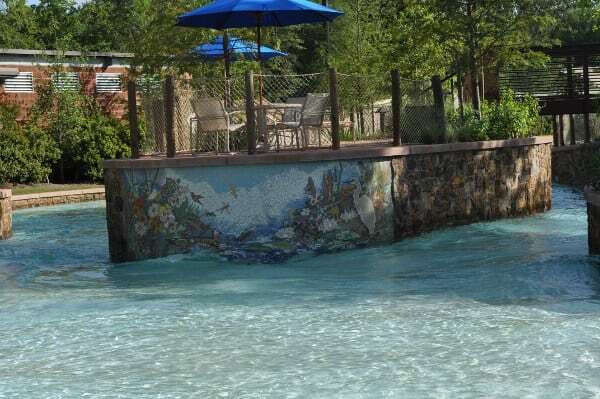 The pools include a lazy river, shallow baby pool, splashpad, giant waterfall pool and the big pool with beach entry, palm tree island and water slides. All around the pools are lounge chairs and poolside food and drink service… but we never stopped to get a chair… we were too busy! The lazy river was probably our favorite pool. The current is slow at the start and you can float down the river. Half way through you find more beach chairs and a water slide. 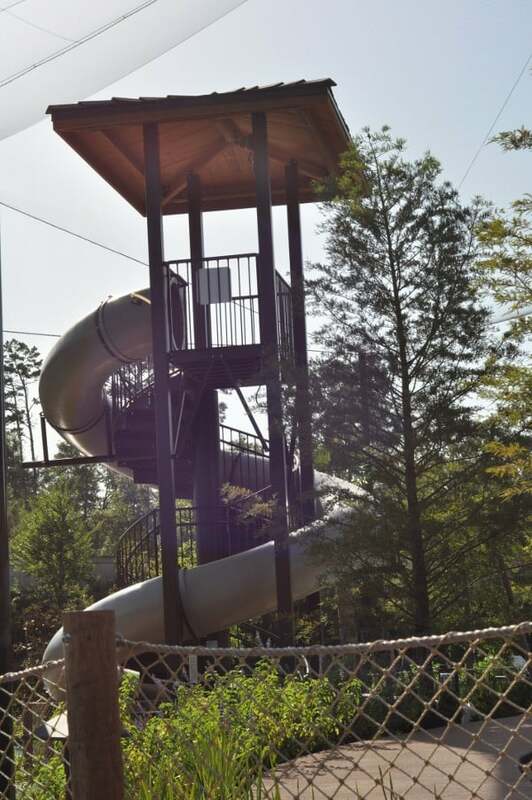 This “secret” slide generally had no line and was a much faster slide than the ones at the main pool. And by faster, I mean that it shot the kids down like rockets. The second half of the lazy river had a small wave machine that made the water choppy and more fun to float through. At the end, if you don’t walk towards the beach entry, you get pulled back along the river… which my kids just “accidentally” swam directly into each time around. So around and around we went. Floating, swimming, walking through the river, shooting down the slide, bouncing in the waves… and doing it again and again. In the middle of the pools was the little kid area, with shallow kids pool, splashpad and craft and activity station. 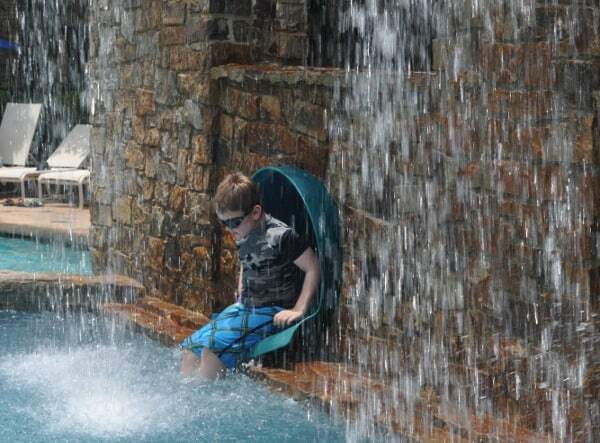 This was a nice break for me, to watch from the edge while the kids floated and splashed. 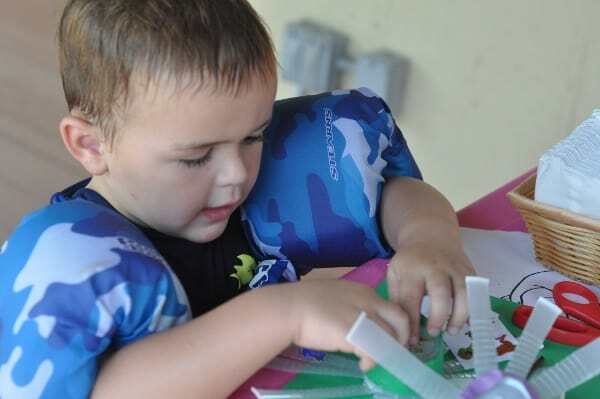 Also, during the weekend, the staff had constant crafts and activities planned… so between splashes, the kids make octopus puppets, played mini golf and participated in dive contests. 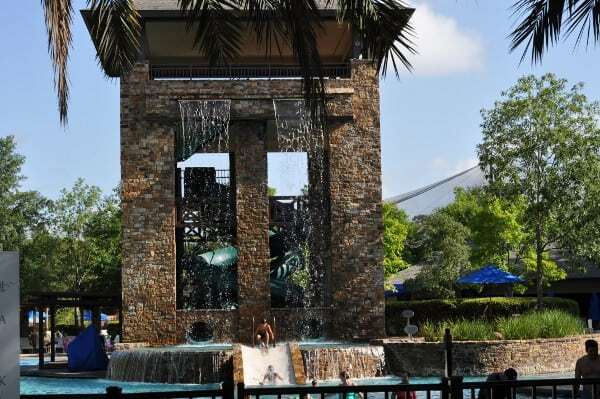 Just steps away was the big beach entry pool and horse shoe shaped waterfall pool. 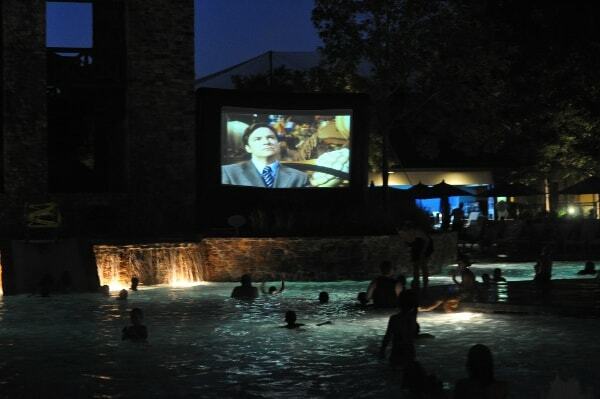 At night time, the bonfire pit opened up for smores and the pool became a dive in movie theater. One night we watched the movie, the next we took a nightime walk around the pools and the lake (and found lots of toads). The nights are so busy at the resort that the mornings are pretty quiet. The pools have just a few families swimming and grounds seem empty. 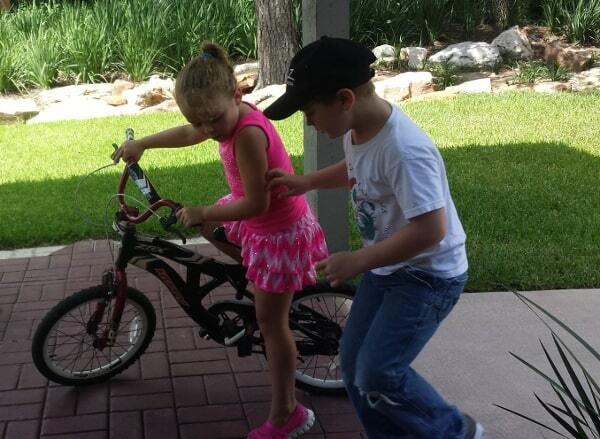 The resort has kid and adult bikes to lend guests to ride the many trails in The Woodlands. This seems to be pretty popular, because the bikes were mostly gone when we arrived each morning. We had brought bikes for the kids and just needed the adult bikes to borrow. Instead of venturing out across busy roads (to the trails), we rode around the quiet resort until we were all ready for the pool. 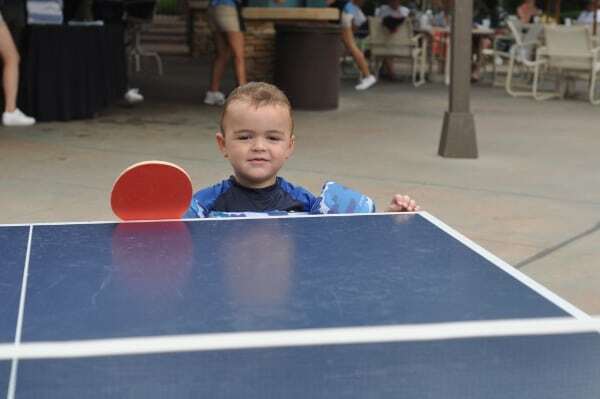 In addition to the poolside food service, the resort has a a family dining room. 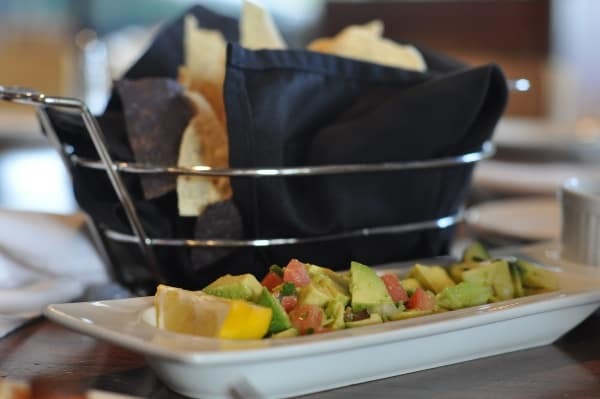 When we visited, kids ate free during dinner time (kids 12 and under eat FREE 5-7pm with purchase of adult entrée and kids under 5 are always free). We liked it best when there was a Saturday night buffet, because it had good food and was fast (so we could get back to the fun!). Maybe my favorite part of the resort was that our room was right next to the pools. We did not have a pool-facing room, but we were just steps away from the water. We could run in, grab some water, reapply sunscreen and be back out in minutes. 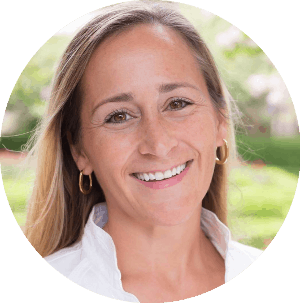 See our updated 2016 post HERE. and 2017 post HERE! Floaties and toys are allowed. Feel free to bring noodles and small water toys. 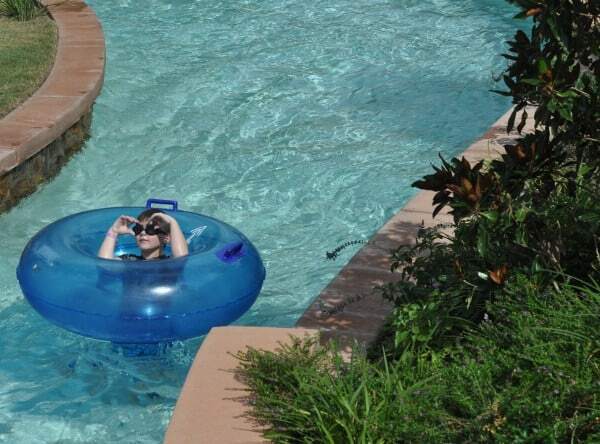 Tubes are provided for the lazy river, but just in the big size. My kids slipped through (often on purpose)… but if yours truly want to float down the river, bring a small innertube. Bring your life vests if you need them… but if you forget, ask the staff. We left ours in the car on our first trip to the pool and when we asked the woman at the towel station, she found some vests behind the bar for us to borrow. Wear sandals! The sidewalks are super hot in the middle of the day. Bring some cheap flip flops that you don’t mind (potentially) losing. 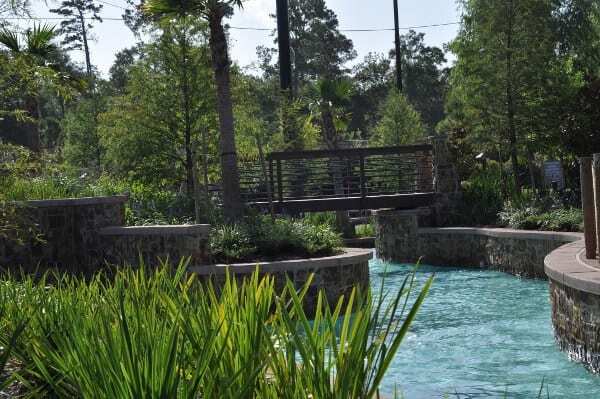 It makes walking between pools much nicer, and you can kick them off before you jump in. 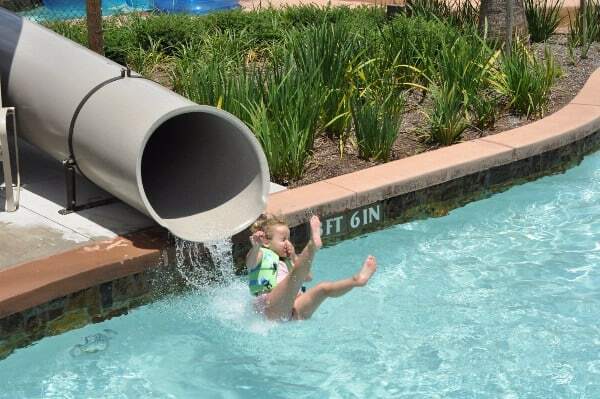 To use the slides, kids need to be 42″… My 3 year old was just shy of this at the front pool… but at the back “secret” lazy river slide, he was just over the mark. He was certain he had grown between the front and back of the resort. You might want to check out the back slide if you have the same issue at the front slide. No outside food is allowed by the pools… but we brought our own groceries for snacks and a light lunch to eat in the room. We stored them in the mini-fridge and this saved us some money (because my kids are eating-machines). We also brought in gallons of water to be sure we stayed hydrated. Bring lots of sunscreen and run back to your (very close) room every hour to reapply, get a drink and eat a snack. Mornings were very quiet at the resort. When we visited, you could have the pool (almost) to yourself at 8:00am. See our updated 2016 post HERE! If you go, tell us about it! If you are looking for more easy roadtrip ideas, go HERE!